My newly-married daughter Meg has arrived for a visit with her husband Seth. I’ve waited a long time (not that I pressured her or anything) for Meg to find the right partner, and she chose well. I only wish the circumstances of their visit could be better. Meg’s father Philip and I attended their lovely small wedding in Granford, which was marred only by a minor fender-bender in the parking lot of the hotel where we were staying. After we’d sorted that out, we left for our home in New Jersey. Then Meg and Seth told us they’d finally gotten around to planning a honeymoon, one which would take them to Monticello in Virginia, and of course I invited them to stop and visit us in New Jersey on either leg of their trip. They were planning to spend a night or two with us on their way back to Massachusetts (both of them have professions which provide free time during the winter season, so they could be flexible in their planning), but then things got a bit complicated. You see, when we arrived home we discovered the body of our long-term handyman in our back yard. I told Meg that she might prefer not to visit at such a difficult time, but she insisted. You might know that she and Seth have somehow become entangled in solving more than one crime in Granford (surprising how much crime there seems to be in such a small town! ), and naturally Meg wanted to help. Seth was a darling to agree to accompany her, and I’ll confess I was grateful for their support (and Philip was too, although he sometimes finds it difficult to express his gratitude). The solution to the crime proved to be a surprise to all of us, but Meg’s clear-eyed observations were important to resolving matters. She even managed to win over the local police chief, something Philip had been attempting to do for quite some time. It was a bit of a rocky start for their marriage, but I have every faith that they will weather whatever storms life throws at them—together. And a giveaway! 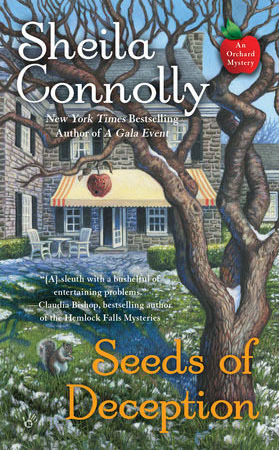 It seems only right that the marriage and the honeymoon should go together (even if Meg and Seth were a bit slow to figure that out), so I'm offering a copy of A Gala Event AND of Seeds of Deception to one lucky winner who leaves a comment by Tuesday evening. Seeds of Deception (Orchard Mystery #10) will be released on October 4th. Find it at Amazon and Barnes and Noble as well as other bookstores. Love me some Seth and Meg! It was fun to hear from Meg's mom and now I'm all geared up for Seeds of Deception! Can't wait! Thanks for the chance to win! I have already preordered this so if my name is drawn give it to someone who hasn't been lucky enough to discover you. Looking forward to all your books. Now I want to read more after reading this from Meg's mother. This is a new series for me. Thanks for the chance! Thank you for this wonderful chance to win the 2 books I'm missing from the collection. Seth is a very patient man. In between crime solving, Meg drags him to visit her old hometown (which is not where her parents are living--but I borrowed my own), which of course produces an unexpected clue. In return, Meg's mother shares all of Meg's baby pictures with him. Looks like trouble might not just follow Meg but get there ahead of her! Great giveaway, thanks. I think I'd be afraid to go anywhere near her (although she does always figure things out). Love all your books. These look good. Thanks for the chance to win. A fun offer. Then two books would be a great addition. Wow! Great opportunity to read your books. I appreciate the chance to win this generous giveaway. This is one of my favorite series. Love Meg and Seth. Sounds like a great series. Definitely on my TBR list. Can't wait for Seeds of Deception. Loved the article. Thanks for a chance to win Seeds of Deception. I've never visited Monticello. Would like to some day. Thanks for the giveaway. I've never read this series, but it looks great! I love cozy mysteries, so I know I'd love these. Thanks for having the giveaway. I have enjoyed Sheila Connelly's previous books. Looking forward to reading the newest of the series. dbahn(at)iw(dot)net. I haven't read "A Gala Event" or "Seeds of Deception" yet and they sound like intriguing reads. Can't wait to read. Love your series...all of them! Cannot wait to read the new Seeds of Deception! I would love to win this giveaway. Reading is the best "me" time! This is a great giveaway!!! I love this series and haven't got to these two books yet. Thank you for the chance. Dear me, Elizabeth, how very distressing to come home to such a shock. I'm glad Meg was able to assist in putting this episode to rest. And, Sheila, thanks for the opportunity to meet such engaging people :). That's rbehling. Stupid little phone "keys." What a marvelous package to giveaway...thank you. I am a big fan, and love your reading journeys. I would love to read both of these books! Thank you for the chance! I do like to be surprised. I love this series, thanks for a chance to win. A favorite series from a favorite author. Looking forward to the latest~! Love this series. Anxious to get my hands on the newest. down rain the first night and we ended up sleeping in the car. Thank you for this opportunity. What a great intro - I was just drawn in! 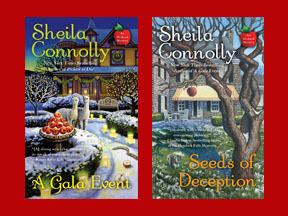 I love Sheila Connolly's work and started reading her Relatively Dead series. Would love to start this series too! Hope I never come home to a dead body.Sounds like a great cozy. Thanks for this opportunity. I love reading about a good wedding!It sounds like their honeymoon was a little untraditional but fun. Thanks for the chance to win!! !